On October 2, Feldmar Watch Company hosted a special event with Bremont. I had the pleasure to meet Nick English (co-founder of the brand) and Mike Pearson (Director of North America) during the event. Having always been a fan of the brand, I was extremely excited to finally see them in person. Nick English, co-founder of Bremont. The night started with a short presentation by Nick English himself. During the presentation he shared with us some of the new watches that Bremont has released or will be releasing soon (e.g. collaborations with Jaguar and Boeing to name a few). The most interesting part of the presentation for me were the personal stories that Nick shared. He shared with us the tragic story of his father's passing, a turning point in their lives that would eventually lead to the beginnings of Bremont. But where does the name "Bremont" come from? In the late 1990s, the English brothers had to make an emergency landing on a farm in France due to an engine issue. To their surprise, the farmer welcomed them to his home and provided them with food and shelter for three days. They later discovered that the farmer was very much like them, he was also a pilot and had a passion for clocks and timepieces. In honor of the farmer's hospitality, Nick and Giles decided to name their watch brand after him. The farmer's name was Antoine Bremont. Definitely one of the most interesting stories I have heard when it comes to the origins of a brand's name. The first watch that I remember seeing from Bremont was from their MB (Martin-Baker) collection. Martin-Baker is the worlds largest manufacturer of ejection seats. The MB watches are tested to ensure that they can withstand the same conditions that the ejection seats are subjected to (e.g. shock, vibration, temperature extremes, salt-fog test). These watches come equipped with an anti-magnetic Faraday cage and an anti-shock case mount. Bremont's slogan states that their watches have been "tested beyond endurance"... so you know that these watches have been designed to take a serious beating. Even Bremont's stainless cases have been hardened to 2,000 Vickers to withstand abuse (normal stainless steel is usually less than 200 Vickers). Below are the MBII and MBIII models. The MBIII model has a GMT hand, while the MBII has a day display. The fit and finish on these watches is quite outstanding, they are more beautiful in person than in photos. My only complaint on these watches would be that the leather strap is quite stiff and too long for my wrist size (6.25")... I had to use the very first hole on the strap. Do love the different colors available for the case barrel. This is the ALT1-P Pilot with the blue dial and blue leather strap. Like the MB models, this one also has an internal rotating bezel. The blue dial has a nice sunburst effect to it, perfect for people that love watches with blue dials. The overall dial design kinda reminds me of Fortis. ALT1-P Pilot with the blue dial. If you are looking for a phantom watch, the ALT1-B (GMT) might be the right Bremont for you. The DLC case and black dial gives it that stealthy look while the red and white accents provide just the right amount of pop on the dial. And if that was not good enough, take a look at the beautiful rotor on the back of the watch... stunning! Open case back displaying the beautiful rotor on the ALT1-B. For something more dressy, the ALT1-C Classic will not disappoint. Simple in design and straight to the point. This particular collection has several color dials to choose from, Feldmar had the cream dial available. Personally I would go for the dark grey version... or the green. ALT1-C Classic with the cream dial. This is the Bremont Boeing Model 247, made from Boeing aviation grade Ti-64 titanium. Again, a less is more approach. Not my favorite Bremont... but the blue accents on the white dial is nicely executed. Open case back on the Boeing Model 247. Boeing Model 247, MBII, and ALT1-B. Perhaps their only non-aviation inspired watch (so far), the Supermarine has a depth rating of 500 meters (S500) or 2,000 meters (S2000), depending on the model. I was able to try on their silver dial S500, which was beautiful. It had a gorgeous sapphire bezel and the rubber strap is easily the most comfortable strap from the entire Bremont lineup. Looking at their available variations on the Supermarine, I must say that my favorite is the blue and white version. Cannot go wrong with blue and white! Supermarine S500 with the silver dial. Love the comfort of the rubber strap. But the most interesting watch of the night has to be the limited edition Wright Flyer. Not only does it contain Bremont's first ever unique movement (BWC/01), the rotor on the watch actually has a piece of the original fabric used on the 1903 Wright Flyer aircraft incorporated into it (Bremont sure knows how to do killer looking rotors). Now that is priceless... literally, priceless. Too bad the dial design is not for me. Interesting vintage design... just not for me unfortunately. Original fabric used on the 1903 Wright Flyer aircraft is actually part of the rotor! Though I was not able to try on all the Bremont watches available at Feldmar that night (you can see the entire selection in the two photos below), I was able to try most of them and got a good sense and feel about this brand. Overall I left quite impressed with the brand and their products, specially considering how young the brand is. Really like their original designs and the different collaborations they have done so far. Price point wise they are a bit higher than I expected, competing against more known brands... but they are less common and less mainstream (for now). I would not be surprised if a Bremont found its way into my collection some day. Special thanks to Feldmar Watch Company, the Bremont crew, and Chivas Regal for an amazing night. Do not own a Bremont at the moment so my AP ROO was on duty. Mike Pearson photobombing ;-). 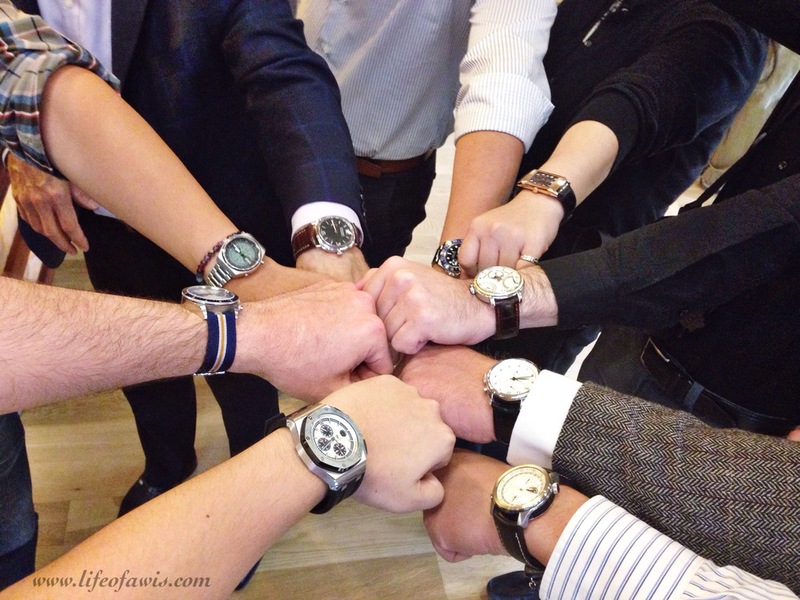 And no event is complete without the mandatory group wrist shot! #LAWatchGang with Mike Pearson.